What is going on with this terrifying ball of flies? Louise Davis, a water resources advisory officer in north Devon, UK, was doing an assessment of the local river Torridge. What she found mystified her. Enormous balls of flies were dangling from trees over the water. Each "ball" was solid flies — perhaps hundreds of the insects. She'd never seen anything like it. None of her colleagues could explain it either. She had to contact a fly specialist to solve this mystery. It was only when she passed the images on to Martin Harvey, a leading fly expert, that the answer was revealed. The fly concerned turned out to be Atherix ibis, part of ibis fly family. Martin explained that the flies are known to adopt this strange behaviour, but that it was ‘not often seen’. Martin explained that the behaviour takes place when the flies are preparing to lay their eggs. Females come together to form dense balls on branches overhanging rivers. 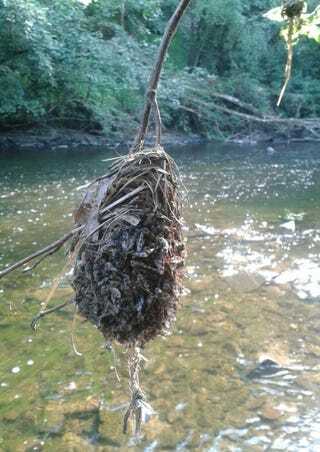 Often these balls can consist of several hundred flies and are frequently formed where flood refuse has been caught in a branch, giving a good base on which the flies can cling. The females then lay their eggs in a glutinous goo and then die, leaving a suspended mass of dead flies and eggs. When the eggs hatch the fly larvae drop into the river’s water to begin the next stage of their life cycle. I think this is further proof that nature is awesome in its majesty and variety. And also? If crap like this is happening on Earth all the time, the creatures from Alien might as well be real.